Use PID Tuner to tune two-degree-of-freedom PID Controller (2DOF) and Discrete PID Controller (2DOF) blocks to achieve both good setpoint tracking and good disturbance rejection. 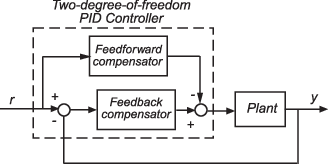 A two-degree-of-freedom PID compensator, commonly known as an ISA-PID compensator, is equivalent to a feedforward compensator and a feedback compensator, as shown in the following figure. The feedforward compensator is PD and the feedback compensator is PID. In the PID Controller (2DOF) and Discrete PID Controller (2DOF) blocks, the setpoint weights b and c determine the strength of the proportional and derivative action in the feedforward compensator. See the PID Controller (2DOF) and Discrete PID Controller (2DOF) block reference pages for more information. PID Tuner tunes the PID gains P, I, D, and N. For the PID Controller (2DOF) blocks, the tuner also automatically tunes the setpoint weights b and c. You can use the same techniques to refine and analyze the design that you use for tuning one-degree-of-freedom PID controllers. Double-click the block. In the block parameters dialog box, click Tune. PID Tuner opens, linearizes the model at the model initial conditions, and automatically computes an initial controller design that balances performance and robustness. In this design, PID Tuner adjusts the setpoint weights b and c if necessary, as well as the PID gains. To see the tuned values of all coefficients, click Show Parameters. Analyze and refine the initial design, described in Analyze Design in PID Tuner. All the same response plots, design adjustments, and options are available for tuning 2DOF PID controllers as in the single-degree-of-freedom case. 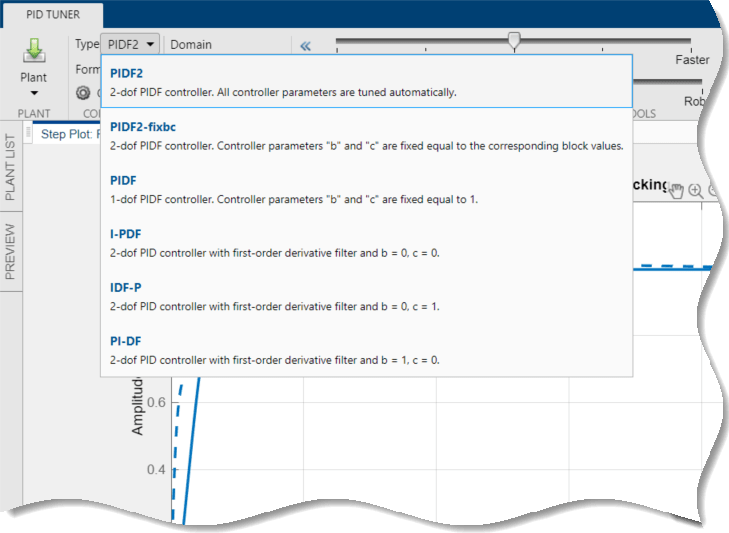 Verify the controller design, as described in Verify the PID Design in Your Simulink Model. When you tune a PID Controller (2DOF) block in PID Tuner, additional options for specifying the controller type become available in the Type menu. These options include controllers with fixed setpoint weights, such as the controllers described in Specify PI-D and I-PD Controllers. 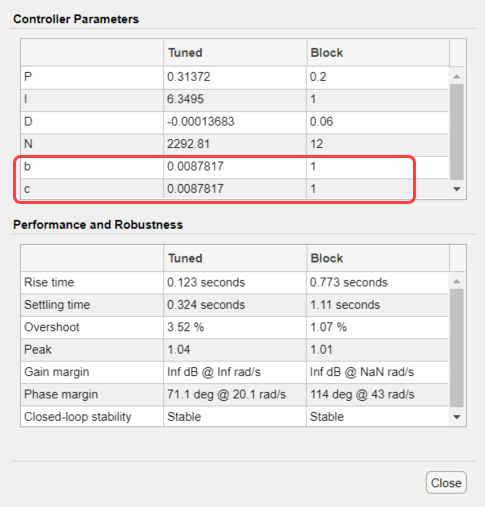 The availability of some type options depends on the Controller setting in the PID Controller (2DOF) block dialog box.